1970 Gift Basket. 45th Birthday Gift Basket. 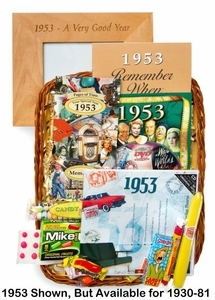 45th Anniversary Gift Basket. 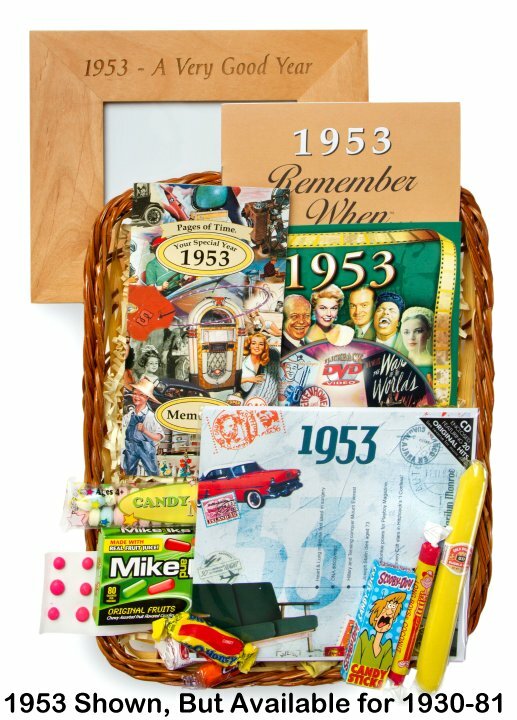 Celebrate your 45th event with this gift basket full of products honoring 1970. This 45th gift basket contains a bag of candy from the 1970s decade, a greeting card from that year, a small book of 1970 events, a 1970 DVD of events from that year, a picture frame that say 1970- A Very Good Year, and a 1970 CD of the top 20 hits of 1970. All these goodies make a unique 45th birthday gift or 45th anniversary gift. The gifts come in an bamboo basket. You can personalize the card envelope with a 50 character message for an additional $5.00 by entering the message on this page. See also our other 45th gift ideas.